يقع في ساوث بورت دوجلاس, Ramada Resort Port Douglas إنه المكان الأنسب لاكتشاف بورت دوجلاس و ما يحيطها. يمكن من هنا للضيوف الاستمتاع بسهولة الوصول إلى كل ما تقدمه هذه المدينة النابضة بالحياة. كما يمكن الوصول بسهولة إلى ‪Bally Hooley‬, رينفورست هابيتات, فور مايل. ببساطة كل الخدمات وأساليب الضيافة التي تشتهر بها Wyndham Hotels & Resorts تجعلك تشعر وكأنك في بيتك. يمكن للنزلاء الاستمتاع بالميزات التالية: أمن على مدار 24 ساعة, خدمة التنظيف يوميًا, متجر هدايا/تذكارات, خدمات بريدية, خدمة سيارات الأجرة أثناء إقامتهم في هذا المكان الرائع. يمكن للنزلاء الاختيار من ضمن مجموعة من الغرف المصممة بعناية لتعكس جواً من الراحة، والتي يتجاوز عددها 186. يقدم الفندق مجموعة واسعة من وسائل الراحة المتنوعة، كمثل: تأجير معدات الرياضات المائية, الغوص السطحي, مركز للياقة البدنية, ساونا, حمام سباحة خارجي. 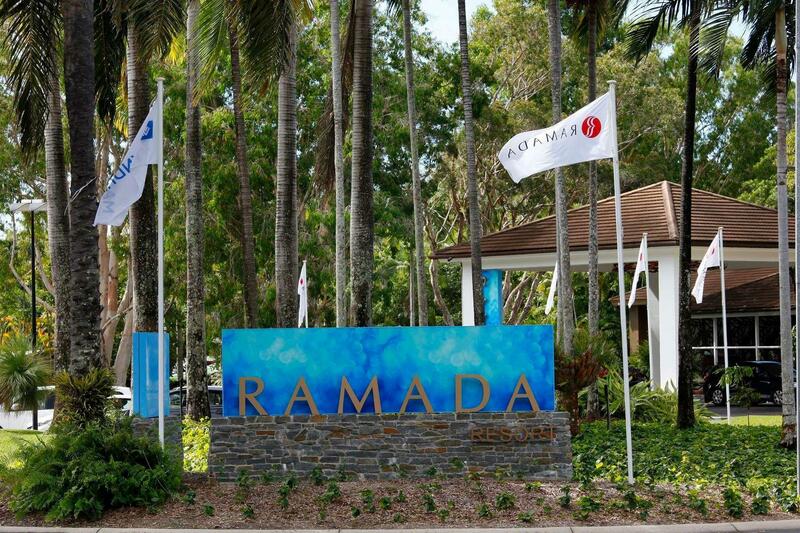 يحظى فندق Ramada Resort Port Douglas بموقع ممتاز وخدمات يصعب منافستها. We loved the look of the resort but it was very far from downtown PD. there was a shuttle but was expensive. 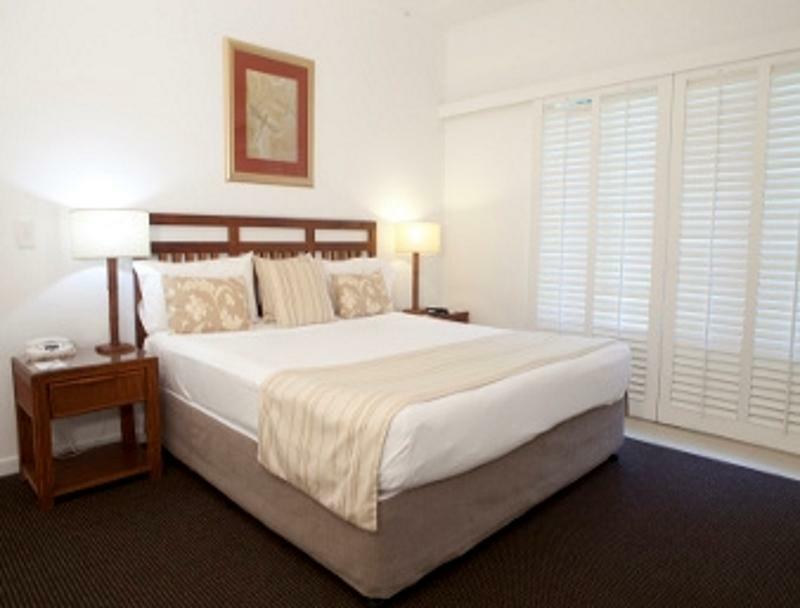 The beds were soft and not very supportive but the room was spacious, clean & modern. Enjoyed our short stay overall. 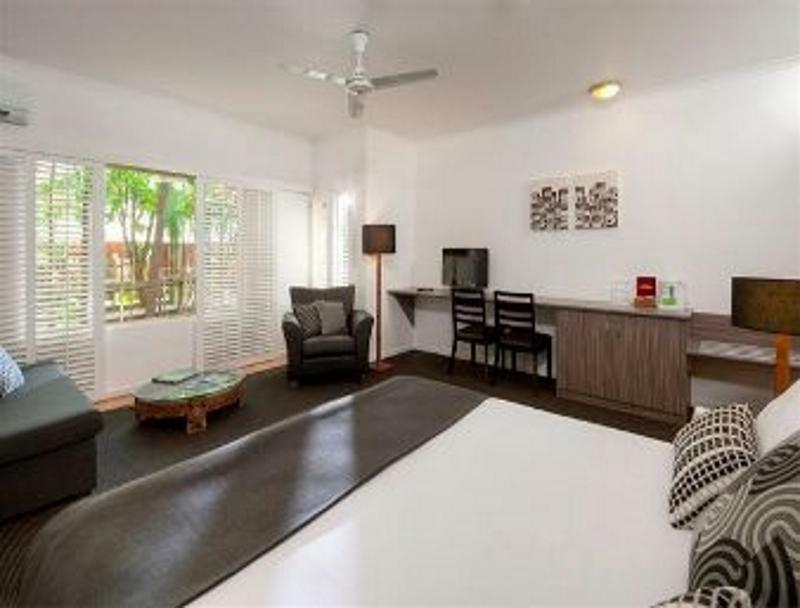 After doing the tourist thing for 5 days in Cairns I found my 3 night stay at the Ramada resort the perfect place to simply relax. The resort has an onsite restaurant serving breakfast, lunch and dinner along with an all day menu for those snacks by the pool. The restaurant/pool area could do with a splash of colour but no biggy. The staff were all friendly. Its only a 5 minute stroll to the beach. As a solo traveller it suited me to use the shuttle bus into the town centre and back. I was happy with my room, it was clean and very spacious. The down side was that i was unable to use the free wi-fi as the connection was never strong enough. Reception booked my day tour and transfers back to the airport which was great. Wyndham try to sell you there loyalty program, but i didn't find them pushy, once declined they left it as that. Great place to get away and unwind. Overall a great place to relax and unwind with a cocktail by the pool. The resort itself is lovely, everything was clean, staff were friendly. I think the bathrooms could use an update mainly because shower curtains freak me out and seem really gross. Also i thought when i booked breakfast was included but that may have been an agoda error as i specifically had it as an option when searching for the hotel. Anyway i explained this and got 30% off breakfast or something like that which was ok. Also the breakfast was a really good buffet. Wasnt a fan of being asked to buy a $120 voucher to use for the resort it seems pointless and they tried to mention they do this because they dont spend money on advertising...so what does that have to do with me, I found ramada on agoda, who needs advertising anyway?i booked accommodation here and if i want to spend 120 ill spend it so why try to sell me a voucher, so i dont get time to use it, it defaults? and/or have to come back to a ramada resort? Kind of scammy if you ask me as there were no benefits to it. Facilities were good and ideal for relaxation. Sounded like zero room service - When asked for extra towels / shampoos, receptionists were saying "what happened to the ones already in the room!? ", "If you need towels come down and pick it up". "If you need plates, go to restaurant and pick it up". And when I went down, the guy at reception was clearly not impressed with me taking shower couple of times :D May not go back mainly because of this. Also the place is like 45 minutes walk from main town, which may not suit everyone. I booked there for relax but I couldn’t use wifi in my room and also couldn’t use swimming pool as well. If I cannot use it they have to let me know before book that hotel. But when I complain about it, they said its available to refund so If I want, just move to other place. Then how can they refund about my time? Cuz it was one night trip. I check in at 5pm how come I can find the other place and re book agian? Anyway it was not satisfied. Amazing place for people with a family not a place for a solo traveler or couple , breakfast was amazing make sure u get buffet breakfast included when u book. The staff where always there to help and if u needed anything you only had to ask we really enjoyed our stay !! The facilities are nice enough. There’s hardly any natural light that gets throu to the pool due to the trees so although very tropical there is a drawback to it. The pool wasn’t inviting to us at all just looked dark and a bit dirty. The bar didn’t have a good selection of drinks. I’m told they have downsized their range as renovating that area. As a consumer I didn’t appreciate this, I’m on holiday I want drinking options also the bar closed fairly early I thought. Overall it was fine, not great and not totally horrid but was ok for the price I guess. We got a great deal on this place and loved our stay here. It is a bit on the edge of town but didn't matter as we had a car. The free wifi was only available at the bar/restaurant which we weren't too impressed by. The pool is lovely but not very big so once there are a few kids jumping in it quickly feels crowded. Its not the resort i was expecting. Customer service is very poor. Rooms are little tired and dated Room smelt like bleach. A/C couldnt be adjusted to either make it cooler/warmer & couldn't turn it on/off. The staff was kind especially the night auditer in front desk. 99 percent of staffs are very nice except the counter staff in the restaurant. He was unkind and felt that he did not welcome everytime I went there. The room was good enough and clean. Housekeepers were awsome~! If I have a chance, I will definately visit in Ramada again!!! Thank you mate! The staff were the standout of this this resort, very helpful and smiling faces, the rooms were a tad outdated and items needed repairs but overall the location and setout is great. Be aware that the double beds are two singles joint together and the pillows are either flimsy line wet paper bags or hard as a rock. The food was really really good, a nice pool, overall I'd give the hotel a 8/10. The staff make the place. Special shout out to Shane who works in the restaurant, great guy. We loved the stream running through the middle of the resort, trees over our head, pool was beautiful, wifi not included in the room (only at the pool and lobby) but it actually made our vacation better to be unplugged! Close to town. Free parking. Loved the nature setting within the resort. It was all good except for the time when they closed the restaurant as there was a wedding so we had to dine outside. However, it's just a 5-minute drive to supermarkets and restaurants. The resort has a nature setting which is a plus. Gorgeous reception area/lounge. Loved the pool so much. We enjoyed our stay and would love to stay again. Highly recommended. Attractive property, close to 4 mile beach ph, great tour options from property. The staff and service at this property was really excellent. Staff went above their expected service levels to assist and make you feel welcome and provided with all the info. Great team at front desk and dining areas. 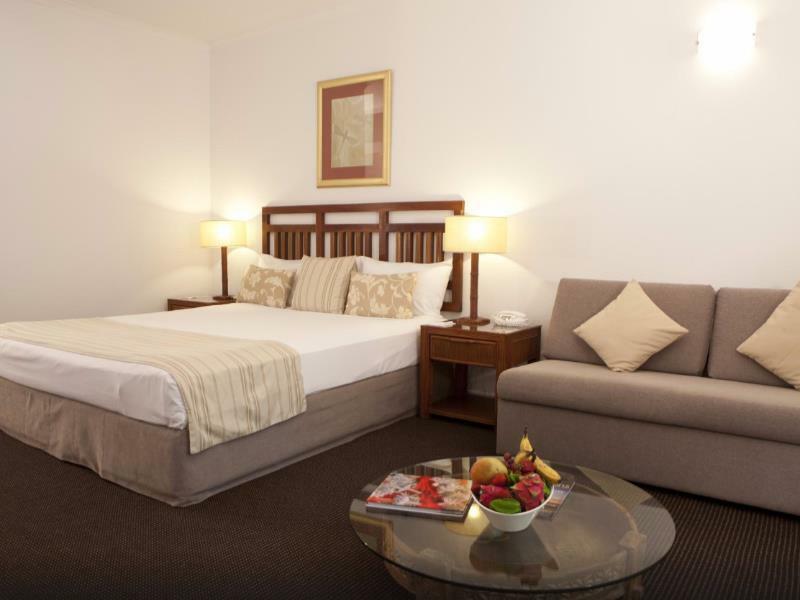 We had a standard room for a good price, better than expected for the discounted price we paid. Bed was comfortable and the room clean, they have a nice tropical looking pool - we didn't use it though as it was torrential rain and have to say the path to the rooms was not covered entirely so we needed an umbrella and it got very slippery..! We asked where our room was and the staff pointed over there and said WE could take the trolley if our luggage was too heavy. The fridge did not work so I reported this, said they would send maintainence..Never showed up. We dined in Restaurant, food had no taste and was overpriced, I was also given the wrong meal. They have a smoking section at the very back of the resort, this was okay, but not one of the Staff there asked if we would like a drink or anything to eat. The pool is freezing. None of the staff ask the people who are around the pool if they would like to order anything from the menu. Even the pillows were lumpy and the bed uncomfortable. 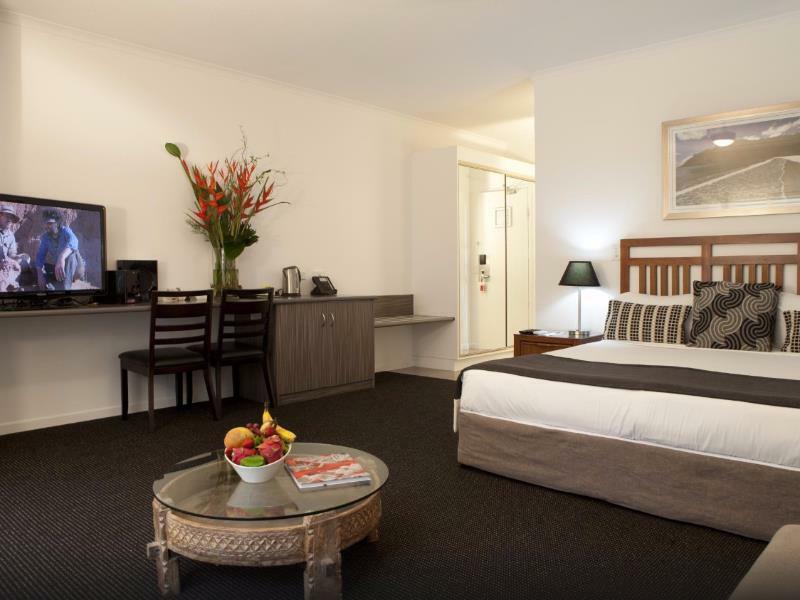 My husband and I stay at Hotels in Australia and Overseas, usually we do not have to complain about anything, as there is never anything usually to complain about. Reservation Staff and Dining Staff need a valuation from time to time. As people who visit the Ramada are on holiday. This relaxed tropical setting was just what we needed as winter-weary holiday makers. From waking to the sound of bird-song, cooling off with a refreshing swim in the superb lagoon-type pool, relaxing in the sun at the near-by beach, taking advantage of heaps of tours and shopping, to winding down with drinks and a meal at the end of the day in the restaurant in the "tree tops", you couldn't ask for a better break from winter's dreariness.